We have just published a new tutorial on how to mock and simulate JMS IBM® WebSphere MQ. 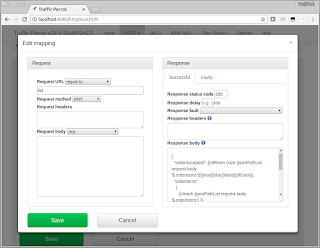 It explains how to use Traffic Parrot systems simulation to allow for testing your application in isolation. Read more. We have started creating a series of tutorials on stubbing, mocking, API simulation and service virtualization. The first chapter is on getting started with stubbing, mocking and service virtualization! How can I simulate an outside system that uses MQ? The simulator you are referring to is typically called a mock, stub or virtual service. If you would like to simulate the outside system to enable testing of your application you should use a mocking tool (also called service virtualization). Just make sure you use a tool that supports IBM MQ. An example of a tool that can simulate and mock IBM MQ for the purpose of testing is Traffic Parrot. How do I mock or simulate a message queue in JMS? JMS mock: When testing your applications you can simulate the non-existing dependencies using test doubles. You can use a JMS mock which will simulate the behaviour of a real JMS provider. You can create a JMS mock using Traffic Parrot. Using a JMS mock will allow you for a high level of flexibility during testing. You will be able to test typical production-like test scenarios but also hypothetical situations by setting up your mock to return almost any type of message. You will also be able to simulate different types of errors, which is often hard to do with real JMS providers. Have a look at this introduction video to JMS service virtualization for ActiveMq (service virtualization is a different name for a mock) or this one for IBM MQ. JMS provider test instance: You can run a JMS provider on your laptop or in one of your test environments and connect your application to it instead of the production provider. When you use open source providers in production like ActiveMQ or RabbitMQ, it should be easy to run one of them on your laptop as well because they are lightweight and free. For IBM Websphere MQ, you can use the free IBM MQ for Developers. JMS class mock: You can use Mockito in unit tests to mock interactions with JMS classes. This solution comes with all the trade-offs of unit testing. For more information on those see testing pyramid. If you would like to black box test your application, use one of the solutions I have described above. If you have any more questions or need help with creating your first JMS mock, schedule a free 30-minute consultation call with our consultants today. Jeff Listfield has published an interesting read on where does tests’ flakiness at Google come from. The main takeaway from that article is that the larger the binary size and more RAM the test consumed, the more likely it was to be flaky. So, try to avoid creating large tests, and you should have less flaky tests! It is worth noting that one way of addressing the flakiness of certain types of tests is using stubbing, mocking or service virtualization. When used properly, it can help stabilize the environment. It has to be assessed on a case-by-case basis if that is the right thing to do. For example, system tests will often be run in isolation, but end to end or smoke tests will require the whole stack to be deployed. What are the next steps if we have done a "POC" and people still don’t want to use service virtualization? A service virtualization consultant recently asked me the following question. "We have finished a proof of concept project and demonstrated that service virtualization would work in our company. We have presented our findings to several teams, but none were interested enough to start implementing it in their sprints. What do we do now?" Service Virtualization Specialist at a Fortune 300 company. There are a few ways this problem can be approached depending on the details and specifics of the organization. There are four key points to make that should apply to your situation. You are no longer only a service virtualization specialist once the proof of concept project has finished. Often, you need to become a salesman as well. You need to apply proper sales and marketing practices to win over individuals and teams inside your organization to help them solve their pressing problems. Good sales people solve people's problems; they do not push solutions. They make people understand what they offer is a good idea for a given situation if there is a big enough problem to solve, or walk away. When you sell, remember you have to deliver value to the teams by solving their real problems of high priority. You have to build rapport and understand why do they think they do not need SV and what problems do they have that you could help them with. You need to “get a Ph.D.” in their internal and external issues. You also have to understand political issues inside the team that might prevent them from implementing service virtualization. Once you understand the whole environment inside out, you can suggest solutions. Remember that in every large enough organization you will find people that will be very keen to try the new approach and individuals that will resist using it until everybody else is onboard. It’s called the Technology adoption lifecycle. Look for innovators and early majority. Some organizations have natural leaders, tech leads, architects or other individuals that developers and testers look up to. You could approach those influencers and work with them to spread service virtualization knowledge. What are your experiences with “selling” service virtualization in your organization? How much of an approximation virtual services might be? I have been asked this question recently by a senior technical test infrastructure architect. After drilling down to details, I have found that an example he was interested in was, for example, virtualizing an existing ESB (Enterprise Service Bus) in an environment where there are no stubs or virtual services used yet. I would rate virtualizing a whole ESB a medium or hard difficulty task, depending on the details. Ideally, I would avoid virtualizing large ESBs as your first service virtualization project if possible and pick other simpler APIs to start with. If you have to do it though, here are my top 3 tips. Please bear in mind there is a possibility they might not apply in your case. Every case is different, especially when visualizing large APIs sets. I have made this mistake myself on one of the projects. We were very confident we will be able to deliver virtual services for the whole ESB in a few months, but after a month we have realised the APIs are so complex that there is no way we could even understand some of them without spending weeks in discussions with the developers. If you have more than 50 endpoints in your ESB, do not try to virtualise everything in one go and spend months doing it. Find a small subset of 1 to 10 APIs that cause problems for the test team and virtualize them in a week or two. Then let the testing teams use those virtual services. Do service virtualization in small increments of work, delivering value to testing teams on a regular basis. Don’t make them wait for months; it is too risky. I was once on a project where the requests and responses contained a lot of data. A SOAP request or response could have included a hundred of different key-value pairs. The XML structure was simple, but the complexity was in the data. If you have an existing environment with many requests and responses going through the ESB, it is likely those are quite complex APIs. Creating virtual services from a WSDL file will generate the data in the virtual services for you that is unlikely to be representative. It is very likely to be invalid data. To avoid problems like that, use record-replay to create virtual services, this way you capture the request and response structure as well as the data. Is virtualizing the ESB a good idea at all? Ask yourself this question, are you virtualizing in the best place? Maybe it would make sense to virtualise some of the backend systems “below” the ESB instead? Maybe it would be valuable and easier to virtualise somewhere “above” the ESB instead? The answer to this question depends heavily on your environment. Contact us to schedule a free 20-minute consultation to help you understand what is the best plan of action in your case. What is your experience with virtualizing ESBs? If you have never heard about stubbing or service virtualization, this article should be a good basic introduction for you on how to reduce test transaction costs. If you already know about stubbing and service virtualization have a look at Traffic Parrot introduction or browse other posts on our blog instead. Many banking and insurance systems connect to third party services that charge for usage on a per-transaction basis. This will often include but is not limited to accessing market data or detecting fraud. When software is tested together with a third party service, you have to pay for the requests your systems make. In many cases, those costs become significant reaching more than $1k per test suite run. This results in unhealthy decision dynamics, like reducing the amount of testing done or decreasing the frequency of test cycles which later increases the technical debt accumulation. There is a simple solution to that problem. Instead of testing the system always connected to the third party service you can introduce a new testing phase and test with a test double pretending to be the real system. After the system has been tested in isolation, you can proceed integration testing but do only a minimal amount of it. This should reduce the third party test transaction costs to the absolute minimum. We have seen a reduction in third party transaction of up to 93%. Service virtualization is a popular practice across the industry. Implementing it will not only reduce third party test transaction costs. It has other advantages as well, for example resolving test data setup and environments uptime issues. For more details have a look at our introduction to service virtualization video. Contact us for a free 20-minute consultation call to help you get started with service virtualization or have a look at our introduction to service virtualization video. We have recently published an article on InfoQ on How Java Developers Can Use the Wiremock Framework to Simulate HTTP-Based APIs. Enjoy!